Gorakhpur was just a symptom. 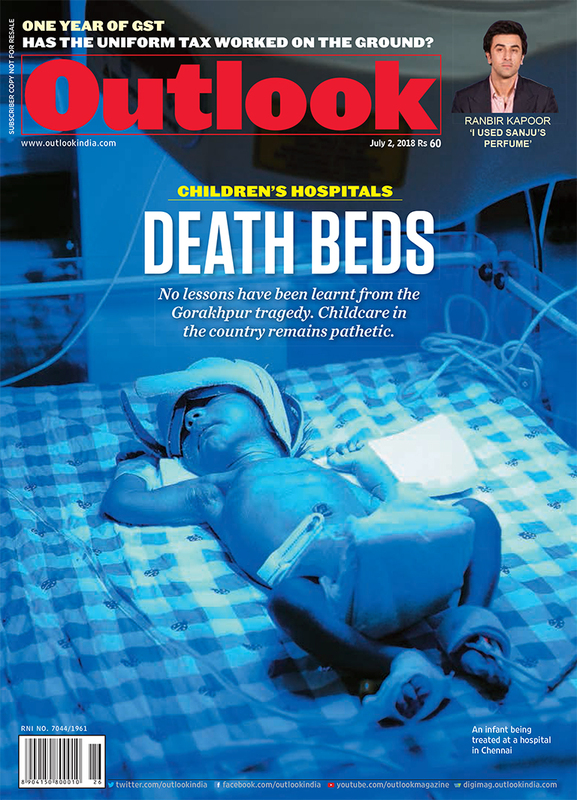 Children’s healthcare is ailing across the country, and it gets worse as one goes deeper into the hinterland. The infant mortality rate in Jammu and Kashmir went down by eight points in 2016-17, the highest fall among states in a single year. It’s the media that made me a hero and then made me a villain, Dr Kafeel Khan tells Outlook in an exclusive interview, a year after the Gorakhpur hospital tragedy. Our society's negligent approach allow children to die without medical care, K. Srinath Reddy, president of the Public Health Foundation of India tells Outlook. What’s Best For The Kid? Who is a citizen? Assam will ­unveil its verdict on June 30. One Year Of GST: GST Or GSTN’T? What hath GST wrought? Weighing up the tax ­reform’s impact one year later, we find a maze of issues to be navigated. Atithi Devo Bhava is touted to be our time-tested credo, but Rishikesh authorities are yet to show evidence of it, writes Editor of Outlook on a 14-hour ride to Delhi's favourite getaway destination. An army of trolls has been marshalled against Shahrukh Khan; Farooq Ahmad Dar, the infamous human shield by the army claims he was offered Rs 50 lakh to participate in Bigg Boss; Sambhaji Bhide, head of a Hindutva outfit has a recommendation for those who want many sons; Read all the juicy gossips here..
A lucid book on this greatest of Indian philosophers is to be lauded. But the attempt at a scientific validation of the assertion about Brahman falls flat.